To get spark some inspiration for interested participants for Rilakkuma Shop October Contest, we did a small sample costume design! You do not have to follow our format! You can decorate your plush with accessories or any other material you can find and take a photo! That's it! Simple and it's going to be fun! Hope to see your entry soon! Support us by share this post with your friends! More details on the contest can be found here. I will be entering my own drawings into the contest, and I wanted to ask if we are allowed to submit a set of costumes (for example, Rilakkuma and Korilakkuma dressed as salt and pepper shakers) as one entry? 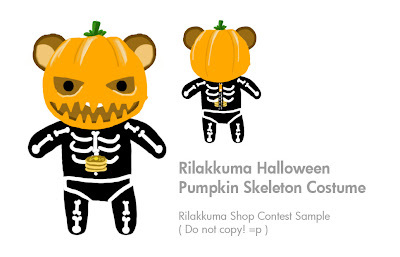 Or are we allowed to submit only drawings of Rilakkuma by himself? Sure! you can submit any drawings! be it korilakkuma, Rilakkuma or even kiiroitori! am i supposed 2 draw it on com or paper?